Can anyone tell me WHERE to find mods/files on this that are not redirected to a Russian site? Welcome, Crusader1307, to Stronghold Nation. Now when you said this, another thing came to my mind - we don't have Stronghold Europe here either... We only have it uploaded to free file hosting websites; which is not a problem as long I have it, but still... We could do something about that. But we do have a separate website for Stronghold Europe in English. On the other hand, we don't have anything about Russian Story mod here, but I could put some effort to get it. Of course, with permission of the creators. By the way, can I ask, why do you want to avoid Russian websites? Is that because you expect that the mod would be in Russian if you get it from there, or something else? Perhaps you find it hard to download it from there because of the language? I am from Serbia, it's also a Slavic language and we use Cyrillic - similar to script used by Russians, if that is the case, maybe I could help you. Which game is the mod for? It is a Stronghold Crusader mod. They introduces snow and stuff like that into it, and they also made buildings to look at they used to look in Russia during middle ages. ADDITION: I believe this ( http://russianstory.ucoz.ru/ ) is their official website. From there one can download version 2.0, and the patch 2.1. I'll have a look at it later today, it is possible that this mod is in Russian, but I believe that we should be able to easily get the English text, and speech as well - if we want, and if it is not in English already. Thanks for your prompt reply Eagle Prince, First... I have files of very impressive hovels and churches modded from The Russian Story site. They work well in BOTH Stronghold 1 and Crusader. After some research, I found that several other buildings (stables, statues and wells) are NOT included in the download. No one on this this of "The Pond" (and other fansites) can seem to help. I was just curious as to if anyone else was interested. I am currently working on an update mod using these "new" gm files. To the second question, I have a very hard time with strange virus attacks from these sites. I have a fairly robust anti-viral platform but alas! Well, I am interesting in those stuff, although I wouldn't be able to offer any help right now, as I have a lot of obligations. Too bad to hear about that thing with a virus. If I get something more than you've got, I would upload it to Google Drive, and I would share the links here. I've done the same thing with Stronghold Europe today as well. You're welcome! By the way, I didn't make it to download 2.1 patch today, the server was pretty slow this evening; I hope I will have more luck tomorrow. I will let you know through this tread when I upload those two to Google Drive, so you could compare those two. I hope you will be able to find something from there that might have been missing to you, although the best would be for both of us to have it all from the beginning, of course. So True. The original files, found and downloaded from Stronghold Heaven were only what I mention previously. 4 hovel designs (duplicated), the chapel, the church, ALL farming structures, the woodsman shack and a very impressive iron mine. Apparently, the original modder did nothing else other than a redesign of the wooden Keep. I agree that the snow maps are strange. But, if one was interested in a Norseman thing, this could be neat. You downloaded your files from Sronghold Heaven? I am downloading mine from some website www.playground.ru. There are two files uploaded by user ICE-DOG. I believe that should be one of the creators. Speaking about their official website, they are offering one link to download each Russian Story 2.0 (900 MB), and Russian Story 2.1 patch (200 MB), but I didn't make it to download it from there. First I didn't see any link to download the mod, and after I tried to register, the website wasn't accepting my anti-bot answers (text one needs to type from an image of animation). I also meant to ask Lord_Chris about this. Would that be possible for Stronghold Nation to host these files? Russian Story would take 1.1 GB, while Stronghold Europe takes slightly more then 500 MB. I do realize this is quite a lot of space by the way, and downloading this could burden the server. Perhaps the best solution would be to upload those two to Google Drive like I meant to do, and to share those links in Downloads Central, or in one or two treads inside Stronghold Crusader & Extreme forums? By the way, the patch has been downloaded, I'll try to install Russian Story now. Afterwards I will also check what can be found at SHH about it as well! Sorry EaglePrince, it will probably take up too much space and resources on the server. 1.1 GB for a single file is an abuse of the system resources. Downloading it will not only hit, but exceed the resource limits of the sever, and you can only upload files to 510 MB to start with. You are welcome to split a couple of the most important parts (such as unit skins, building skins.etc) and put some smaller files there, but it's too big by itself. I think the second option of uploading them to Google would be better, creating threads with links to them in the SHC forum would still be reliable as it's from our site and Google so people can trust them. I was expecting that answer, 1.1 GB is really a lot in this context. I will upload those to Google Drive as soon as I test Russian Story by myself, and of course, I guess I should ask those guys for permission as well. Thanks, Chris! Ah, the Quest begins!. I went to your link site. Same trouble. And I agree. 1.G is WAY to much. The file transfer would be the best. And yes, some of the building mods did come from the 2nd update of Stronghold Europe found at Stronghold Heaven. The first version has the same modded file as everybody whose ever downloaded it. All Stronghold Buildings with evolved and semi-evolved hovels. The second version was the one with the Russian Story Building mods installed. Weird, huh? That's what started my mission, as it were. Also since our last conversation, I did some research and found ANOTHER one! Stronghold: Medieval Empire, roughly the same Russian story mods but with s few extras. I tried but the site would not let me on. Thanks to everyone who has given me such great responses. Hmm, this is a great finding! I have seen one screenshot now, it seems like they have introduced wooden towers there, which is really nice, and stuff like that Russian Story was missing in my opinion. I noticed how each keep there in skirmish game is a wooden one, while all around are stone walls and stone towers, which doesn't make much sense. On the other hand, being able to build wooden fortification - that is a great idea. I hope I will be able to find it, and download it, so I could try it. As about Russian Story, I will not be running those two exe files until I check other possible sources, or until I contact creators of Russian Story on their official website. One thing I noticed is that on official website is says that that Russian Story is 900 MB, and not 1.2 GB like this one I downloaded. 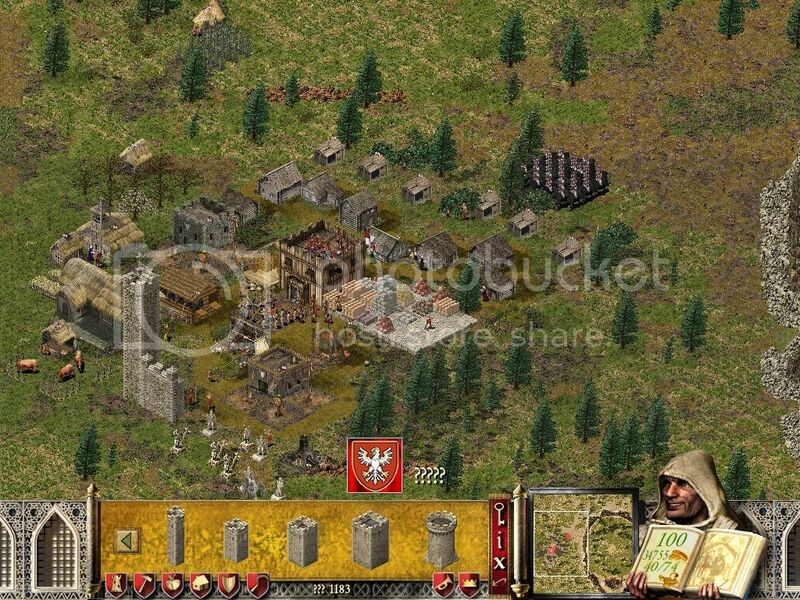 МЕ (Medieval Empire) - новый мод на легендарную игру Stronghold 1. Однако, МЕ не столько мод, сколько серия игр - мы планируем выпускать другие обновления к серии Stronghold. 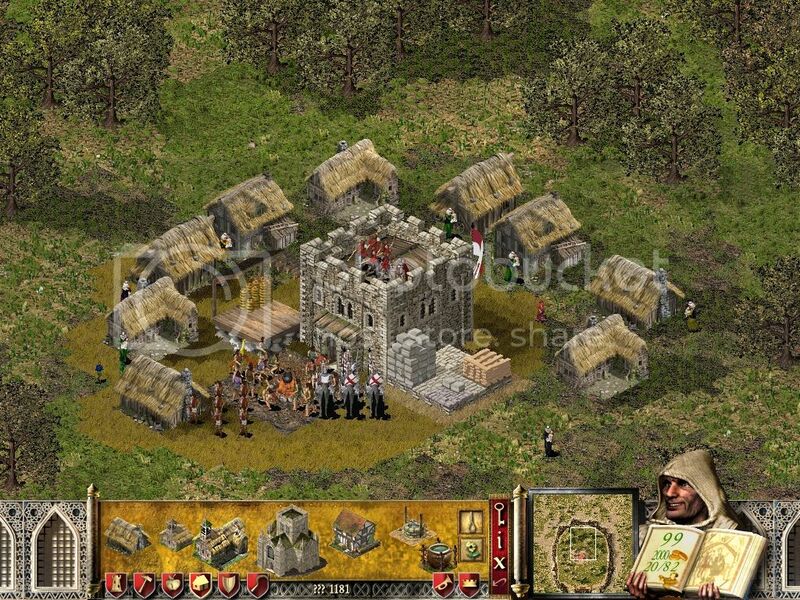 If I understood this correctly, the first sentence says: "ME (Medieval Empire) - new mod of legendary game Stronghold 1". Still, models from these mods might help you with your work as well, even if I am right. I also posted them a question at their guest book, I hope we'll get some reply there. THIRD ADDITION: I also found this page, and I saw that they were posting stuff there recently (December 26), so I hope we will get some reply there as well. This sounds like a very interesting quest, that you brave knights are on. If you get a chance to post some pictures of the new building designs, that would be cool. I would certainly do that. I tried running this larger exe files, and I had several problems. First one is that it was taking too long until my PC made it to run this exe file. I guess that's because they made it so large - it's more than 1 GB... After some time, the PC managed to run it, but there was another problem. Everything was in Russian, and ciryllic is not being displayed as it should. Instead of ciryllic I see some weird letters with dots and stuff... I tried to extract those exe files, but it didn't work. I tried it using 7zip. Do you have any ideas, how to extract these two files? Maybe that is not necessary, but with this incorrectly displayed Russian I feel like walking in the dark while I try to install this mod. 7zip and UniExtract didn't do the job. I did it! I installed Russian Story and I got those edited files! Still, some other problems remain. The whole game is in Russian (ciryllic), and none of those letters is being displayed correctly. When I installed Russian Story 2.0 it was relatively OK, although I wasn't able to read ciryllic characters, but installing 2.1 version everything became messed up. Those characters seem to look even worse - now they are only some vertical bars instead of letters, and I cannot see the cursor. I can move it and click on stuff though, it's there, only I can't see it. Does someone know how we could fix those things? With different letter, and this with the cursor. I would only like to add that, compared to Stronghold Europe mod, although Russian Story introduces more original things, such as completely new design of church, chapel, iron mine, woodcutters hut, wheat farms, etc... Russian Story might seem a little bit incomplete, they didn't take much care about some specific details. Also, I'd like to add that they really did a great job, they really put a lot of time into it. ADDITION: If this with letters can't be corrected easily, than I would suggest just using those models inside Stronghold Europe maybe. It would fit there as well! Speaking about translating this into English, or doing something like that just by copying a file - I will try that later, but I am unsure if that will work, as number of AI's is not the 16 nor 8 here... But it is possible that this won't make any problem, and it is possible that this thing can be done. If I am right, entire text from the game is inside one file that should be possible to open using Notepad. The whole game is in Russian (ciryllic), and none of those letters is being displayed correctly. When I installed Russian Story 2.0 it was relatively OK, although I wasn't able to read ciryllic characters, but installing 2.1 version everything became messed up. Yes, I believe that is how it looked like when I installed 2.0 version. Later, when I installed 2.1 it started to look different than that, but then it wasn't the only thing messed up. Thanks, I will try that tomorrow. First I will try to use the original file from Crusader, or something like that. Maybe that will work. So, here are some screenshots. I managed to run Russian Story 2.1 by changing the exe file. I removed the one that may have been changed after patching to version 2.1, and I put there my Stronghold Crusader 1.0 exe file (recommended by creators is 1.1). This is screenshot from 2.1, later I will add a screenshot from 2.0, because hovels are different. Here, you will see those things different then in Crusader: hovels, woodcutters, all farms, lookout tower - it's no longer round (it's square now), stables, church, chapel, monuments, granary, iron mine, barracks, market place, well... There may be some more stuff that were changed. ADDITION: This is another screenshot - with hovels from 2.0 version. There is one more really good thing - it is possible easily to translate entire game to English. The downside is that Russian Story has it's own campaign which would need to be translated in harder way, but everything else works pretty well as far as I can see. SECOND ADDITION: If someone is interested to download this mod, but he doesn't know from where, I could give him the link. As about uploading some stuff by myself, I will wait a little more if I make it to get a reply from someone of the creators. One way or another, I will post the link to download - at least two links to download from a Russian website with instructions how to do it - if it's hard for you to make it since it's in Russian. Thou art truly a Prince! I am starting to travel down the road you cleared. As stated before, I was working with Version 2 hovels. You found even more! Thank for showing those pictures, Eagle Prince. And thanks for bringing this mod back to life and to our attention. The buildings look very good and from what I gather, it has a nice story to it, too. If someone manages to translate it into English, it could be an asset for the international community. Unfortunately I can't help with that as my Russian is pretty much non-existing. But there are several Russian Crusader 2 players (Fire Ranger comes to mind). Maybe support can still be found.